Back in 2002, Evo’s review of the definitive sports version of the Integra, the Type R, ended with an eloquent conclusion : “The Integra is the fastest – and arguably most enjoyable – front-drive coupe on the planet.” Thirteen years have passed since that sweeping statement was made, a lifetime in the automotive world. Performance Coupes and hatchbacks have moved on in leaps and bounds, with many of them now generating performance and power figures which can stand shoulder-to-shoulder with an early ’90s Ferrari. Dual-clutch gearboxes with lightning fast changes are the norm. Electronically adjustable suspension and numerous driver aids allow any combination of surfaces to be tackled with equal aplomb. In 2015, is the Integra still relevant? Chances are you’ve seen more DC2 Type R model Integras on UK roads than their lower-specced brethren, such as the 1.6 EX . It’s not that the Type R was the majority seller; far from it. It’s just that the standar d Integra coupe was a horribly inconspicuous car, the quiet guy in the corner sipping his drink – whereas the Type R personified the life and soul of the party. Whilst it possessed a wholly inoffensive and predictably streamlined coupe shape, Honda’s traditional ’90’s JDM approach of thin panels, small wheels, plain fittings, and limited colour choice lacked both the styling flair and visual impact of cars such as the Fiat Coupe and Vauxhall Calibra, and the bomb-proof build quality of something like the BMW 3-Series coupe of the time. 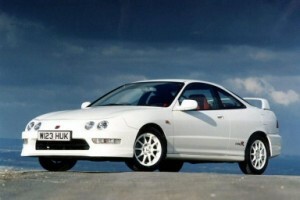 Indeed, the Integra may well have went the way of other unmemorable Japanese coupes – Nissan 100nx and Mazda MX3 anyone? – were it not for the frenetic Type R model which headlined the range, with its high rear spoiler, road-hugging front lip, red Recaro seats and Type R graphics. The Integra was defined by the Type R. It was an example of a Honda (whom we might barely recognise today) taking a car to the absolute extreme in order to make it handle better, grip harder and corner faster than any other FWD (or even RWD) competitors. Unlike many other fast coupes and hot hatches of time however, Honda didn’t just apply basic modifications to the suspension and lump in a bigger engine to achieve this transformation from mundane to magical. 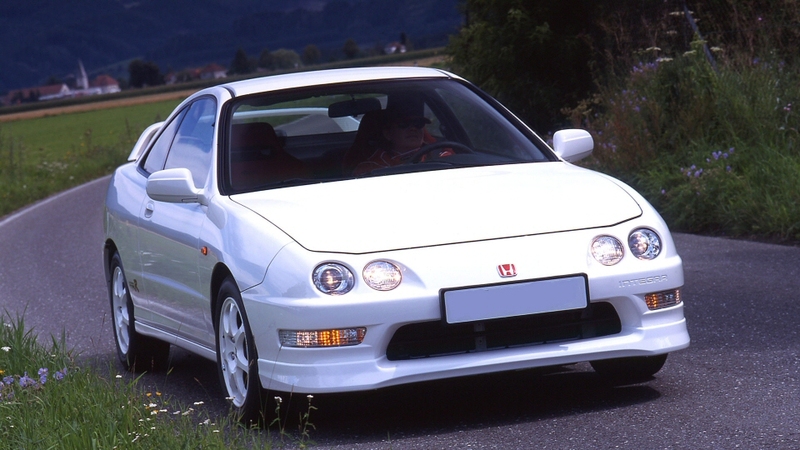 The Type R possessed numerous differences from your standard run-of-the-mill Integra. It had an aluminium bonnet. The front windscreen was 10% thinner to save weight. A vast amount of the soundproofing was removed, and the alloy wheels were lightweight versions. The chassis was strengthened with extra spot welds and thicker metal around the rear shock towers and lower subframe. It had a lightweight crankshaft, a torque-sensitive Heletical LSD, double wishbone suspension, a short-shift gear selector with shortened ratios and 4-pot Brembo brakes. 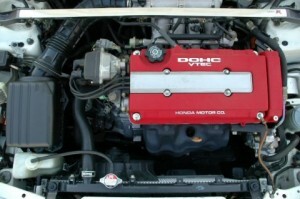 Under the bonnet lay the real heart of the Type R, the hand-built B18C – Honda’s 1.8 16v DOHC Vtec engine. Developing 187bhp at 7900rpm, this screaming banshee of an engine allowed the Integra to hit 60 in 6.2 seconds and eventually max out at 145mph. Utilising Honda’s infamous Vtec variable timing system allowed the engineers to develop this much power from the limited 1.8 litre capacity; while most cars are gasping for air around 6000rpm, the Type R switched cam profiles, got its second breath and thundered on to the 8500rpm redline. As a driving experience, the Integra was a sensation on any stretch of asphalt. Twisty B-roads roads were its natural stomping ground though; perfect swathes of tarmac where the driver could be astounded by the levels of grip generated by the 15″ alloys shorn in Bridgestone Potenzas, with minimal body roll from the carefully tuned factory suspension. The chassis setup dictated that lift off-oversteer was not only allowed but actively encouraged, with the playful rear end and front LSD working in perfect harmony to allow drivers to tighten their line mid-corner rather than being subjected to typical FWD understeer. The undiluted feedback from both the steering and chassis, combined with the smooth, short and precise gear changes and that howling engine, ensured that the Integra was not just effective – but also fabulously rewarding. As with any incredibly focused performance car, all of this ability came at a cost: comfort. Honda’s utterly single-minded and uncompromising approach guaranteed that the Type R was not a car best suited for motorway marathons or docile Sunday drives, with its tight-hugging seats, stiff ride and lack of soundproofing ensuring that it was a far from relaxing driving experience. Indeed, it was the almost obsessive nature of Honda’s development work on the Integra Type R which granted it much of its appeal. Production of the DC2 ceased in 2001. It was succeeded by an all-new model Integra Type R, the DC5, which again opted for similar modifications to the original (lighter weight, high rear spoiler, Recaro seats, and so on) but with a new K20 2.0 engine and 6-speed gearbox. Although this version also had praise lavished upon it, many purists still refer to the original DC2 as the iconic model of choice, the one which set the tone and broke the mould. The question remains though : exactly 20 years after Honda first introduced the Integra Type R to their domestic market in Japan, can it still stand tall amongst today’s hot hatches and fast coupes? The automotive landscape has changed considerably since 1995. Coupes and hot hatches have generally grown much larger and heavier, and the visual distinction between them grows smaller by the day. Coupled with global crackdowns on manufacturer’s emissions figures, this has seen naturally aspirated and high-revving engines like the Integra’s B18 vanish into thin air. In their place sit more powerful turbocharged units, many mated to DCT gearboxes and often producing torque and bhp figures which – on paper – make the Integra’s 187bhp and 131lb/ft seem positively weedy. Vauxhall’s latest hatchback-meets-coupe iteration of its Astra VXR squeezes out 280bhp and 295lb/ft from its 2.0 Turbo 4-cylinder. Renault’s range-topping Megane, the 275 Trophy, manages similar outputs – 271bhp and 266lb/ft. Ford’s Focus ST is slightly lower powered but still outguns the Integra by some margin, with 252bhp and 270lb/ft. And some manufacturers have pushed the game on even farther into hitherto uncharted territory for hot hatches and mid-range coupes; BMW’s M135i, VW’s Golf R and Audi’s RS3 all hit 300bhp or more, with equally high torque figures. Even Honda themselves, who for so long championed the naturally aspirated engine and developed variable timing technologies to extract its maximum potential, have stopped swimming against the tide and are releasing their upcoming 2015 Civic Type R with a turbocharged engine developing upwards of 300bhp. 20 years worth of intervening technological development ensures that these models are not pared down street-racers like the Integra was. Laden with the latest in automotive ingenuity, many come with adaptive suspensions, advanced traction and stability control systems, various transmission & steering configurations optimised for road/track/snow/air/space, and so on. All designed to make them more versatile, more reactive to driving conditions, and more rapid – whilst still fulfilling their original brief. So the Integra is pretty much outgunned, right? Not quite. These cars may be scarily effective at what they do, but the Integra trumps them in one very crucial area : kerbweight: Even the lightest example out of the aforementioned cars (the Renault) is still 160kg up on the Integra, with a whopping 400kg between the 1120kg Integra and the heaviest example – the RS3 with 1520kg. It is this gulf in weights which highlights both the strengths of the Integra, and the weaknesses of the new breed of hot hatches and sports coupes. An oft-mentioned criticism of the modern cars is their slightly detached feeling compared to the hot hatches of yesteryear; direct control has given ways to servos and hydraulics, with the increased weight blunting reactions, directional changes and fluidity on twisty roads. 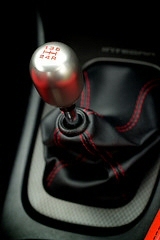 Contrast this with the Integra, a model often referred to for its razor-sharp reactions and hyper-alertness. Whilst there is no doubting the abilities of the new kids on the block, the emotional return on their investment has often been brought into question – true feedback and a sense of litheness are difficult things to simulate, even with modern digital systems. It’s for this exact reason that the Integra has never been more relevant. Whilst it may seem that most manufacturers are content to continue developing bloated models, the Integra serves as a welcome reminder that a car can be devastatingly effect and also offer a truly connected analogue driving experience without having to bulk up or rely on overpowered engine units. Encouragingly, it seems some other manufacturers are still keen to remain true to this ethos too. The Toyota GT86 is one example, a relatively mildly-powered sports coupe with just enough attitude and enough firepower to make it a blast to drive. Cars like the Megane R26.R also champion the benefits of leanness and agility, and in doing so decimate heavier and more-powerful-on-paper foes. Although used Integra Type Rs are understandably diminishing in numbers as time marches on, there are still plenty of good ones available out there – both original UK models, and the marginally different JDM DC2 models with their strip headlights and slightly higher power output. If you’ve never experienced the thrill of driving one (or it’s later sibling, the DC5), do yourself a favour and go hunt one down. It may lack the technical wizardry of its modern day counterparts, and may even give you a migraine and a bit of a sore back ……………………. but it will also will reward you with an intensive driving experience which many of todays fast hatches and coupes can never emulate. This is the next itch for me to scratch...anyone selling one? White, UK version - same as the one pictured please! Hard to find a very clean unmolested once now unfortunately. I had 3 of them and loved them all, both modded and unmodded. Had a DC5 too which is a good car also but still felt the DC2 hit the spot more. Your best bet would be the ITR-DC2 forum, I'd say any cherished examples will appear there first. Great article Gaz, would soon put the notion on for another Integra they really are fantastic driving cars! Love the integra seen a few good examples recently but looked worth their asking prices. I think I need some kind of fast Honda. Help me get over the depression of the saab. If I had the cash spare I'd snap up a mint low-miler DC2 now and lock it away. With Honda going down the turbo road, they'll be seen as a more purist vehicle and unlikely to be repeated again. I loved the MX3 1.8 V6, but then i'm lacking something. I love integras, but it would have to be a jap spec one for me. Great write up.